Recently I was thinking it would be nice to add a burgundy/maroon/sangria/wine/marsala/oxblood skirt to my closet when I realized I could wear my dress instead! Susan from Charming Lucy did the same thing earlier this week, too and it turned out super cute. It also gave me the opportunity to try out the pair of tights I received from Kushyfoot. I am a huge tights fan and wear them often so longevity is an important aspect to me. This pair seems to be made well and even have little massaging nubs on the soles for added comfort. I got a size medium and they fit me perfectly so I would suggest sizing up. I also received a pair of fleece lined trouser socks I wore this week. I'll take a whole outfit made of that please! They were so soft and comfortable and stayed put all day (occasionally an issue with my socks). I am looking forward to trying the Flats To Go, too! I often change from my Hunters boots to work shoes once I am at work so I am keeping them in my desk drawer just in case I forget real shoes in my half asleep, muddled state. Check out my remix for this dress here! I just recently heard about the fleece-lined trouser socks and need to try them out immediately!! This is a cute look. I have a sweater that looks exactly like this, so I always like to see how you style yours. You have created so many cute outfits with that dress! Love how you styled this! Love this chic look, and way to remix your dress. Love that burgundy color and I'll take anything fleece lined. So cute! Great way to remix a dress and I love the color combo too! I LOVE all the ways that you have remixed this dress from Tulip! Hahaha. I love the long list of colors that your dress could be considered. It's a bit ridiculous, isn't it? You'll have to let us know how those tights hold up in the long run! I have such a hard time not ripping holes in the toes of my tights! This dress has been so versatile--love how you styled it here :) And I have a pair of Kushyfoot shoes and they are so perfect for a night out when your feet start to hurt from heels! I love the idea of wearing a dress instead of a skirt! That sweater is the perfect pair to the burgundy. I love those fun tights too! Brown and burgundy mix together perfectly! I love these colours together. The burgundy skirt is just beautiful! Why are there so many names for one color?! I never know what to call it. Sheesh. Great thinking styling your dress as a skirt. I love the sweater color. Burgundy is such a great color for winter! This is such a great idea of layering it to make it look like a skirt and definitely stretches your wardrobe! 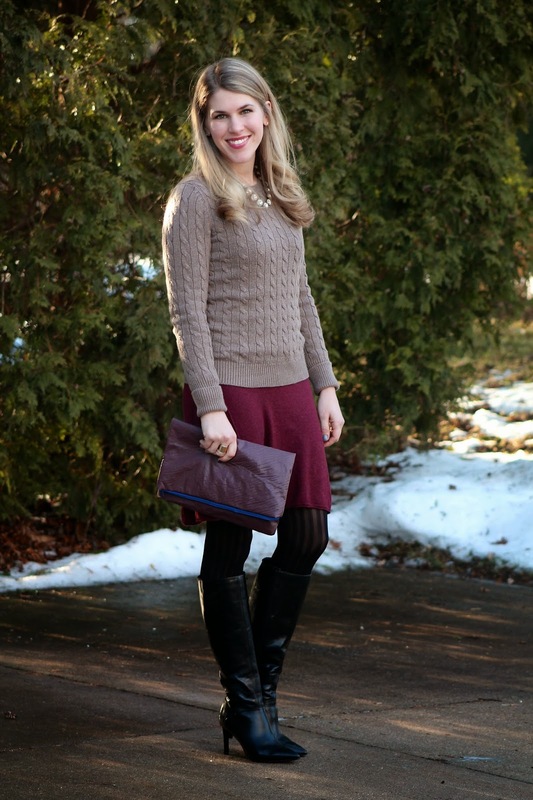 Love your boots and the burgundy skirt! Lovely comfy look!! Fleece lined socks sound good and useful, didn't know about them! I really like this color pallet - and so clever layering up your dress as a skirt! Those tights are TOO cute and I wear dresses as skirts quite often! I usually add a sweater, chambray shirt or cardi on top! Love this wine colored skirt! You found yet another way to wear this gorgeous dress. 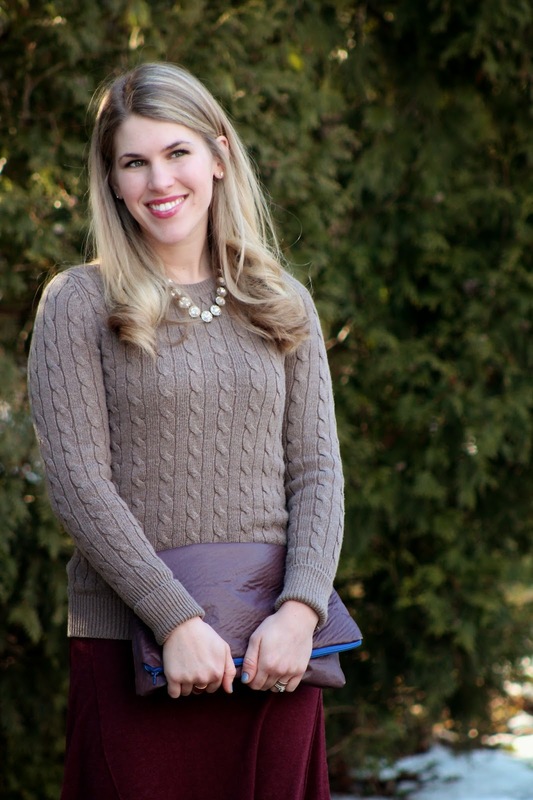 Looks great with the taupe sweater. Those tights sound great. They look identical to this royal blue pair I own. And I loved that you mentioned all the many names of burgundy lol.